Guess what!!! 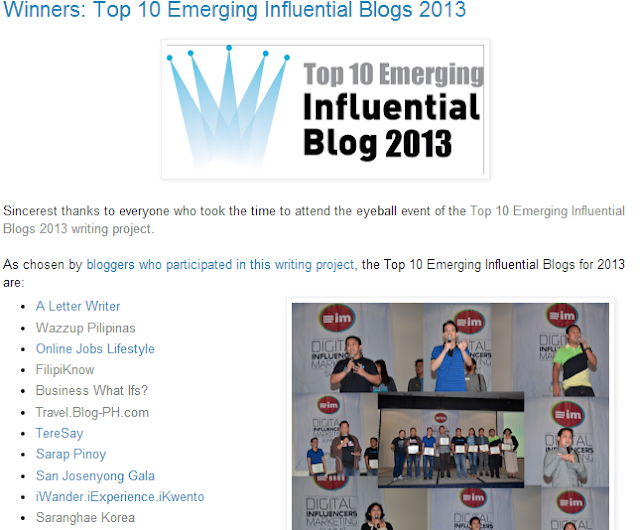 After 8 months of its existence in the blogosphere, Saranghae Korea has reached a milestone as it is ranked number 10 in the Top 10 Emerging Influential Blog 2013. Somebody from the Digital Influencer Philippines emailed me with an invitation to attend a Digital Influencer Summit in Manila last September 21, 2013 because my blog has been included in the Top 10 Emerging Influential Blog of 2013 and the awarding will be conducted during the summit. Unfortunately, I was not able to make it to the summit because I am here in South Korea. God knows how I regretted not to attend the event because it should be the best opportunity to meet some awesome and expert social media influencers in their respective expertise. Thank you to the Digital Influencer Team headed by Ms. Janette Toral. It's overwhelming to see my blog on your top 10 list. Thank you for spearheading this event. I should not let this chance to thank all of you who have been part of this success. First and foremost, I thank all the bloggers who nominated and voted my blog. Thank you for believing in this little hideout of mine and find it worthy to land a spot on this prestigious award. I couldn't mention all of you but from the bottom of my heart, thank you. These groups are my avenues to share my links to my most important target market, the OFWs here in Korea. These groups have been very helpful in promoting my links, through these, I was able to reach out to my fellow OFWs and some of them have been converted from curious clickers into regular readers. Super thank you to the administrators for allowing my links to be posted on the timeline as well as the members who showed their support to my blog. Thank you also to all the readers, may it be a one time visit or a patron reader, you are the reason why I continue this advocate. Of course, everything is for the Glory of our Almighty Creator. Thank you for the wisdom and for the guidance and for making me an instrument to educate people through this blog. SaranghaeKorea has started with an idea. An idea to influence people, an idea to educate readers and an idea to reach out to fellow OFWs through the social media called Blogging. This award reminds me that I am indeed on the right track in pursuing this advocate. You are definitely desrving to win the award sir... Congratulations!